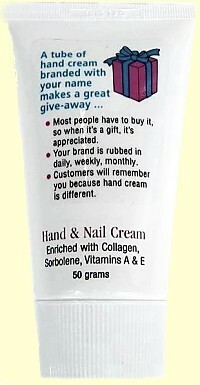 Most women buy their hand and nail cream, so why not give them a tube with your brand and logo? This small 50g tube is non-greasy, pleasantly fragranced and easily absorbes to your skin. Small enough to take with you in your purse or keep in your drawer at work.